It was trickier to get the one-of-a-kind monsters found in the games. Every PokÃ©mon title has you choose a special "starter" from three potential options, and whichever two you don't select get cast by the wayside. There are also unique "legendary" creatures found in the wild that are important to the games' storyline, and they can be the toughest to catch because if you fail, they disappear forever. Though difficult, however, back in the misty days of 1998 none of these trials seemed insurmountable to a young collector determined to succeed. With the right help, I could catch all 150 of those PokÃ©mon! Except there were actually 151. Mew, the secret 151st pocket monster - barely mentioned in the game - was the PokÃ©mon series' first impossible hurdle. Every other challenge was surmountable if you put in enough time and knew the right people to trade with, but Mew, the tiny pink psychic cat-thing, was only given out to people who attended rare official Nintendo events and could not actually be caught in the game. Mew was the first "Event PokÃ©mon" - a 'mon that you could only obtain by physically being at the right place at the right time - but it wasn't the last. With Generation II came the time-traveling Celebi, a legendary PokÃ©mon which is still all but impossible to legitimately acquire outside of Japan thanks to a lack of those kinds of events. Generation III added wish-granter Jirachi and space alien Deoxys to the Event PokÃ©mon list, but new technology was about to add a new hurdle for collectors. 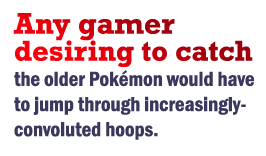 When Ruby and Sapphire moved to the GameBoy Advance, the current games were no longer backwards-compatible with the earlier ones, meaning that any gamer desiring to catch the older PokÃ©mon would have to jump through increasingly-convoluted hoops. Prior to the release of HeartGold and SoulSilver on the DS, a trainer who wanted to capture Ho-Oh would have to first fully complete PokÃ©mon Colosseum (on the GameCube), transfer it to one of the Generation III titles (on the GameBoy Advance), and finally upload it to the Pal Park in Diamond & Pearl (on the DS). That's three different games, on three different platforms - and that's one of the easier ones to get. To this day, unless you made the pilgrimage to select Toys 'R Us stores across the United States during a single week in November 2009, there is no legitimate way to catch the PokÃ©mon god Arceus. For a series that started its life under the catchphrase "Gotta catch 'em all," the PokÃ©mon franchise goes out of it way to make doing just that as complicated as possible. This would be like Mario 64 locking players out of obtaining the last few stars just because they'd never beaten Yoshi's Island.